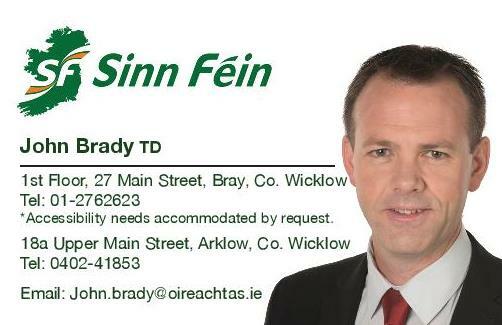 Sinn Féin TD for Wicklow/East Carlow John Brady launched a scathing attack on Fianna Fáil and their flip-flopping on the issue of water charges during his party’s motion on abolishing water charges this evening. Teachta Brady highlighted the cause of a constituent who had contacted him in in relation to an ongoing sixteen week wait for a water leak to be fixed by Irish Water. “It took sixteen weeks for Irish Water to investigate one water leak reported to them as far back as June 8th. This certainly was not the case when local authorities had control of water services. “This leak is causing the loss of two litres of water every minute that equates to over 200,000 litres since this leak was first reported. “So not only are Fine Gael and Fianna Fáil standing over a utility that is wasting money with huge consultancy fees and the installation of water meters, they are also responsible for wasting water that they were initially allegedly set up to safeguard. “The only thing that is clear in the Fianna Fáil water charges debacle is that they were dishonest with the electorate for votes in the last election. We only have to read their election manifesto to see this. “Water charges and Irish Water have been universally discredited and rejected by the electorate.